It’s that time of the year in the U.S. – when we blow up pretty bombs in celebration of the approval of the Declaration of Independence, declaring the independence from the Kingdom of Great Britain. 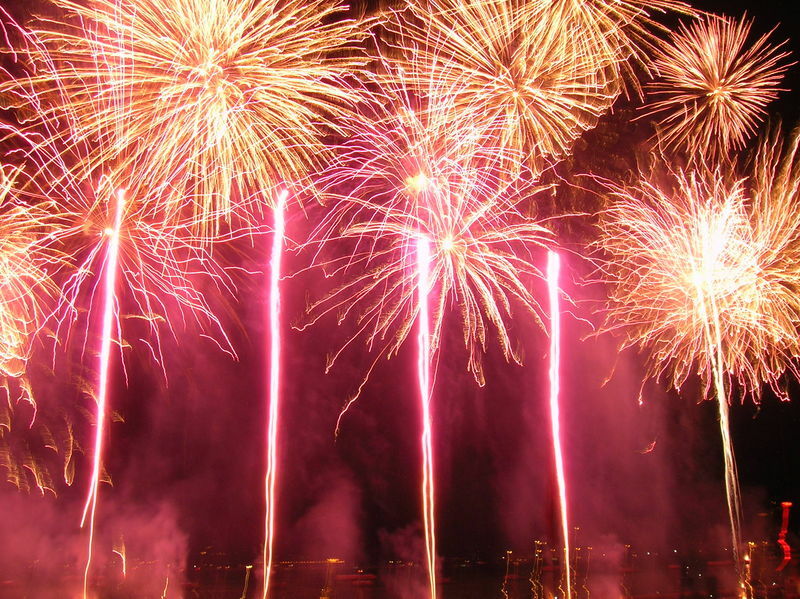 Around this time of year, there is no dearth of articles about the chemistry of fireworks, but the chemistry editor here could not let her secret love of this topic pass by. What is an explosive? An explosive is a combination of materials that when reacted produce an abundance of light, sound, heat, and pressure. A firework encompasses all 4 of those: we are familiar with the light – the whole reason we view fireworks, we are familiar with the sound – the boom that follows especially large displays, we are familiar with the pressure if we are close enough – that’s the force that pushes into you and the “shock wave” pictured in movies after large explosions; and we are familiar with the heat – ever held a sparkler? There are three main types of explosives: chemical, nuclear, and mechanical. The bulk of this post will focus on chemical explosives with a short bit about nuclear and mechanical. If we start at the beginning – well, we’ll skip to the “accepted” first explosive – black powder. Black powder, also called gun powder and the precursor to fireworks, is coined a chemical explosive. Chemical explosions generally fall into a specific classification of chemical reactions called oxidation. The little flame used to catalyze the reaction in the video is actually much more energy than is necessary to cause this reaction to occur, but it’s difficult to get an even littler source of heat and safely demonstrate this reaction. You might also note a lot more energy comes out of that reaction once started in terms of light and heat and sound. I’ve been the one lighting that reaction in a demo without both ears plugged and I couldn’t hear out of one ear for the rest of the lecture. If we focus on the loss of electrons version of oxidation, we get specific colors. This is what the flame video by The Fabulab focused on in their entry for Alan Alda’s Flame Challenge. I direct your attention to 1:08 and the discussion of electrons. Metals are the simplest example (and most used) example of oxidation as the loss of electrons and the color change associated. Because some electrons are lost, we now have a different set of electrons changing energy and a different color appears. From here, it is easy to see how fireworks fall into this category of explosives. 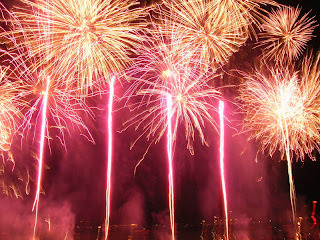 Fireworks are always being further refined to produce a specific set of light and sound. For a bit more information, this video gets fairly specific. The vast majority of explosives in use today are considered chemical explosives. This covers a range of materials, including the aforementioned black powder and fireworks, nitroglycerin, dynamite, plastic explosives (C4 for Mythbusters and sci-fi television show fans), and the ones with water now restricting the amount of water one is allowed to bring onto an airplane in the U.S.
Another type of explosive is a nuclear explosive. The energy in these explosives come from a nuclear reaction. Wikipedia differentiates types of nuclear explosions into stellar and man-made. Another way to differentiate nuclear reactions is by fission and fusion. The explosions at the heart of stars fall under nuclear fusion and are called stellar nucleosynthesis. Nuclear fusion is the process of forcing 2 atoms into 1 new, larger atom. The CNO cycle, diagrammed here, is one of the nuclear fusion reactions occurring in stellar nucleosynthesis. Nuclear fission is the process involved in nuclear weapons. Nuclear fission is the process of dividing an atom into 2 or more smaller atoms. In both nuclear fusion and nuclear fission processes, specific types of radiation are emitted because the new atoms produced do not have the same energy as the starting material. The radiation emitted in these reactions is not just from a change of electrons but from a change from the nucleus of the atom. This emission of radiation is part of the light and heat from the sun and the light and heat of a nuclear bomb. The third and last type of explosive I will cover is a mechanical explosive. These explosions occur as a purely physical process, but can then incite a chemical explosion. Mechanical explosions occur due to a sudden release of a build up of pressure. A specific kind of these explosions are under conditions where a liquid is pressurized in a vessel and a rupture brings it above its boiling point, called a boiling liquid expanding vapor explosion, BLEVE. Steam powered trains were sometimes damaged by these type of explosions. An explosion of a water heater falls into this category. Mechanical explosions are the rarest and perhaps least covered types of explosives. Water heater explosion by the Mythbusters.